Photographer: Jason Kim. Model(s): Hanne Van Ooij. Source: Models.com. Stylist: Rachel Gilman. 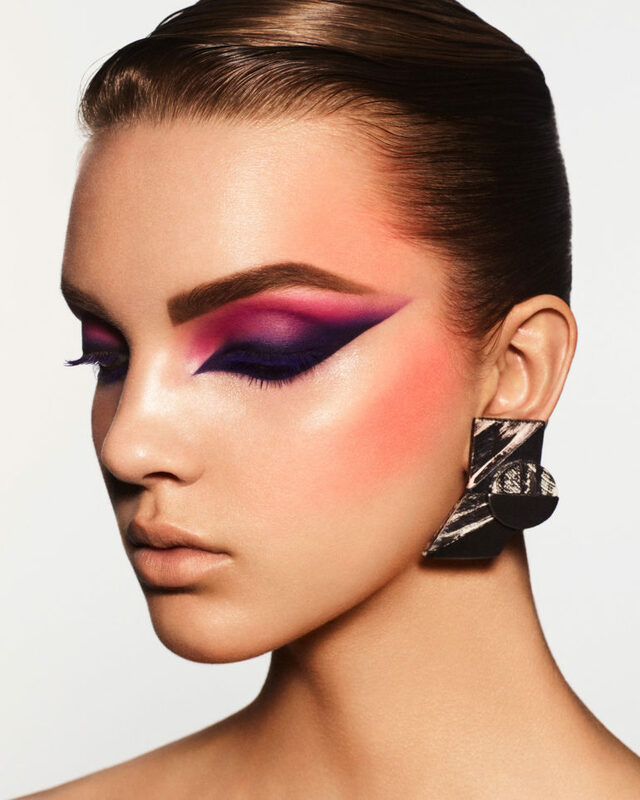 Makeup: Morgane Martini. Hair: Takayoshi Tsukisawa. Hanne Van Ooij rides on high in the “Chroma Wheel” by Jason Kim for Models.com. A mesmerizing mix of art and color. Like a preening peacock showing off it’s wings, her eyes rise to meet the light. Hanne’s face gives off great expressions, emoting like a creature of flight. Morgane Martini creates a wingspan that covers the lids and beyond, capturing the illusion of flight. Graphic shapes seize the orbital field, highlighting the body of the bird. Dynamic colors extend beyond the border of the brows, as this eye sanctuary comes alive. In one of the most exciting expressions captured, a diagonal line runs up/over the brow creating a tail-like effect. 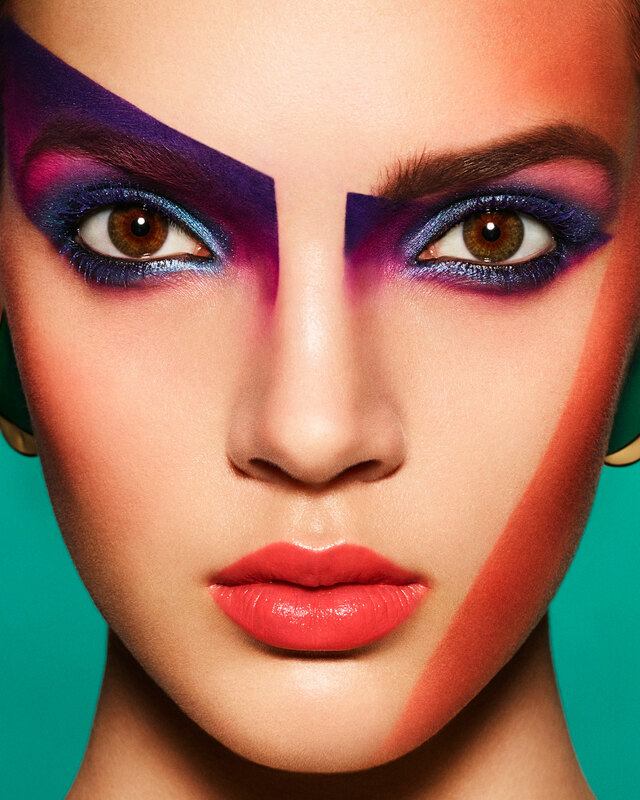 A Teal-blue hue circles the lids, leaving rich magenta & deep purple to be displayed in graphic format. Vibrant yellow is cast across the upper lid, while purple circles the entire eye and flies out the sides. The look is utterly captivating. There’s something unique about the vivid nature of these images, that give the illusion of a live are installation. Like paint being sprayed, you forget you’re looking at simple shadows, and pretend you’re viewing a multi-dimensional palate. The bird of beauty takes flight as exotic eyes-wings dare to ignite. Intense saturation summons the imagination, whisking you away to some exotic locale. Evocatively applied, each image transforms the face making it appear as if she’s becoming something new. The theme of chaos can be one that’s out of control. However, here we see something new. Morgane Martini delivers a dose of delicious, while articulating perfect application. These pictures penetrate the page, as we are compelled by the power of primary colors. Beauty and the Bird ~ go hand in hand as this story takes us to an imaginative land. Martini liberates a more focused view of bold, with yellow and blue lighting up the background. While the remaining 2 images are done in a white backdrop, allowing the orbital arena to shine. Her eyes are like feathers screaming over the face, with euphoric colors that call to the wild. Otherworldly elements evoke a sense of spirit, with lively details that dare to go deep. The theme of chaos can be one that’s out of control, however, here we see something new. Kim goes off the grid giving us a focused view.